So here's a post you guys have been requesting for a while, and now that my load out is finally complete I feel I can really give this post a go! My Femme Fatale load out has been an entire year in the making and has gone through many adjustments. I started airsofting regularly in August 2014 and since then I've slowly been learning, experimenting and finding what works and looks best on me. 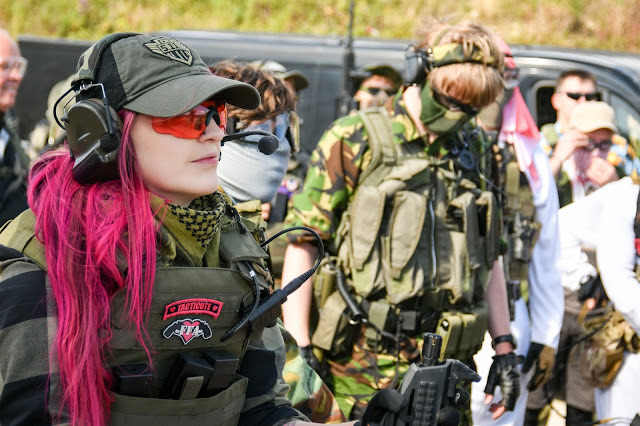 My very first load out was at best, questionable - all black, skin tight leggings, black Karrimor jacket, skull half mesh face mask, mesh goggles, a plain black beanie and walking boots but I was a newb, fresh on the field and didn't know any better. Now at the time, I thought I looked the absolute balls...but clearly not! Since then I have been constantly adding, replacing and rearranging kit to create the perfect load out for me. One of my favourite past times is shopping and I admit, in the last year I've definitely been cheating on fashion with Airsoft! This won't be a review of these pieces as I've already reviewed a few of them already or I will be doing so in the near future! Let's go from head to toe! Head: For my head pro I wear a Nuprol FAST Helmet in black (available here) which I ran bare with just my GoPro Hero on an NVG mount for almost a year until my first Milsim in August, for this I decided to give my helmet a new look and accessorise it a *little* - the first item I picked up to jazz up my FAST helmet was an Emerson MTP helmet cover to give it a little bit of texture and to break up the solid block colour of the black. Next came my comms set up which I got from Battle Store UK - I chose the Z-Tactical Comtac IIs and got a helmet rail conversion set too, these are really awesome as I can use them as just ear defenders or hook them up to my PTT and radio to use as comms. After all the practical elements of the helmet were in place, it was just little aesthetic changes to complete the look I was aiming for. I picked up a few little bits and bobs from www.taiwangun.com - a Modular Personal Lighting System helmet torch in black, a Dummy Strobe Marker Light (back of helmet) and a Purple Distress Strobe (item on top) These, although they are just aesthetic changes to the helmet, they give it the look of functionality. The finishing touches consist of a 'Bullet Proof' Viper patch and a Condor Outdoors blood group patch - which is my actual blood group. The whole look was finished off by giving the whole helmet a light spray with a black spray paint to take away that 'new kit shine' and a quick sanding of the NVG shroud and the rails to make them look worn. In addition to my helmet, I also wear a pair of ASG Strike Systems clear shooting glasses or a pair of black mesh goggles for eye protection and a plain black half face mask to keep my teeth looking pretty. Torso: On my torso I wear a standard issue MTP UBAC, underneath my Warrior Assault Systems Recon Shooters Cut Plate Carrier in Crye Multicam (available here), and I have accessorised it with a Warrior Triple Open Mag Pouch (here) and also the Warrior Cargo Pack (here) both in Multicam. You can usually see a tactical Hello Kitty on my PC, a black or pink sling filtered through my PC straps and depending on if I'm playing a skirmish or a Milsim, the tell tale blue pipe of a hydration pack. This Plate Carrier for me is all about practicality, as I'm quite small I needed something lightweight that would fit me well. This fits me snugly whilst still giving me plenty of room to maneuver in game. The shooters cut helps me shoulder my rifle more comfortably than PCs I have worn in the past. The Mag pouches mean quick releases or reloads and I can carry all my essentials in my cargo pack. Lower half: So on the lower half of my body I run something very new to my loadout that I am really excited about! The Warrior Elite Ops PLB Shooters belt set up from UK Tactical - check it out here! My belt is set up with everything I need for a skirmish - a universal holster, two pistol mags pouches, an M4 mag pouch (the belt originally came with two but I only run one), a medic pouch, dump pouch and extra to the belt, a double 40mm grenade pouch for my two TRMRs. The belt is super useful and looks badass. On the lower half of my body I also run a pair of Viper Tactical Elite Trousers (here) and to finish off, a pair of Viper Special Ops Boots in Multicam (available here). For this load out I run my custom G&G Black Rose which many of you will have seen on Instagram, I run this with a T1 red dot sight, a PTS angled foregrip and an ASG Strike Systems torch. My sidearm which has quickly become my favourite is my WE M&P with pink hand grips. I also run in terms of accessories, a pair of Mechanix M-Pact gloves in black and a bright pink shemagh!